I have often said the cruising community is a small family spread out over a large canvas, and as proof of this, I can point to an encounter I recently witnessed in the un-nautical micro-nation of Andorra, high in the Pyrenees Mountains. This was in the home of Edward Allcard, a once well-known British solo sailor who is now all of 101 years old and has a birthday postcard from Queen Elizabeth to prove it. Having recently re-read Edward’s books and also Clare’s A Gypsy Life, about their days on Johanne Regina, I decided to drop in while on my way to inspect a boatyard in France. 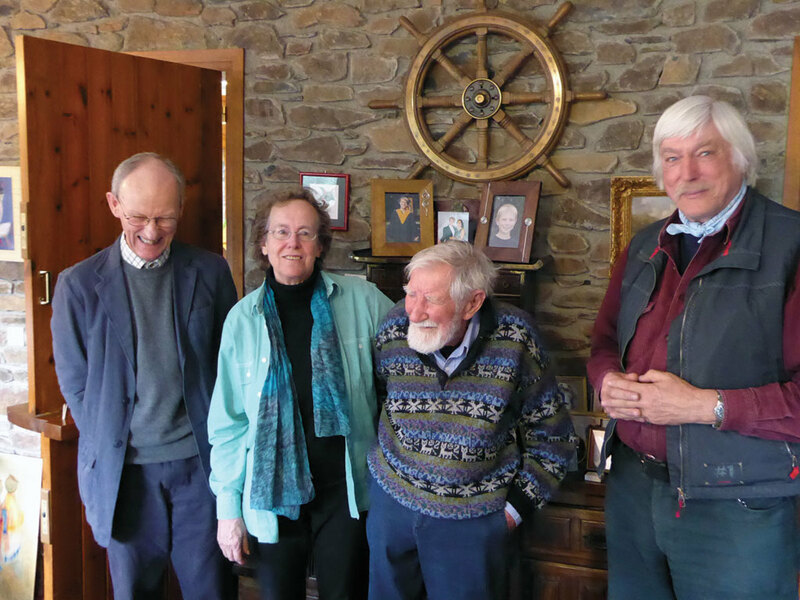 By sheer coincidence, my visit merged with that of British sailing author and SAIL contributor Tom Cunliffe, who had come with his wife, Roz, and his old mate John Lovell to regale Edward and Clare with tales of Johanne’s pre-Allcard days. It so happens Johanne was the very boat that led Tom Cunliffe into his wayward life as a sailor. He’d given up studying the law and was driving trucks in 1965 when he answered an ad and joined the crew of Johanne, then a derelict hulk lying in the mud of the River Hamble in England. Over the course of a cold winter, Tom and company—including John Lovell, the acting first mate; an ex-Royal Navy man named Bob, who had a gambling problem and was hiding from an Australian mobster called Joe Bananas; and one Peter, who couldn’t afford shoes and instead wore plastic bags on his feet—worked feverishly to refit the boat before sailing it south. Johanne’s owner of the moment, Tom claimed, was a cruel man who kept his crew on tight rations of gruel and just one Mars bar a week. Eventually, Gambler Bob (who each week cut his Mars bar into seven daily portions) tried to brain the tyrant with an anchor, but Tom, fortunately, saved Bob from completing his mutiny and knocked him down before he landed the blow. The most onerous chore was reballasting. The crew pilfered iron pigs from a nearby wreck and slaved with chisels and hammers to chip these into the proper shapes and sizes. Finally, they were hastily set in concrete in Johanne’s bilge during a raucous New Year’s Eve celebration. Not long afterward, Tom explained, the old ketch was caught in bad weather while crossing the Bay of Biscay and started taking on vast amounts of water, which was blocked from reaching the bilge pumps by the concrete. Tom and Bob saved the day only by madly hacking channels through the concrete with pick-axes mid-gale. On hearing this Clare Allcard became agitated. “So you’re the ones!” she exclaimed and recalled with some bitterness and much humor how she’d had to chip out and remove all that old concrete over a decade later. The fairy-tale ending was that Johanne was the vehicle through which Tom met Roz and started a family of his own. It was Shoeless Peter who’d first met her and a girlfriend in a nearby pub in mid-refit and brought them to the boat. A fateful encounter, for you have only to look at Tom and Roz to know they were meant to be. Tom ended up jumping ship in Madeira to rejoin Roz back in England, and soon enough they were afloat on a boat of their own. They named their daughter Hannah in part after Johanne. As for John Lovell, he stayed aboard and saw Johanne all the way to the West Indies, in spite of her owner. Once there she was ultimately found and revived once again by the Allcards, who launched her on a new series of unlikely adventures.